Visiting Paris without sampling all the delicious offerings at a boulangerie or pâtisserie would be a crime against humanity. 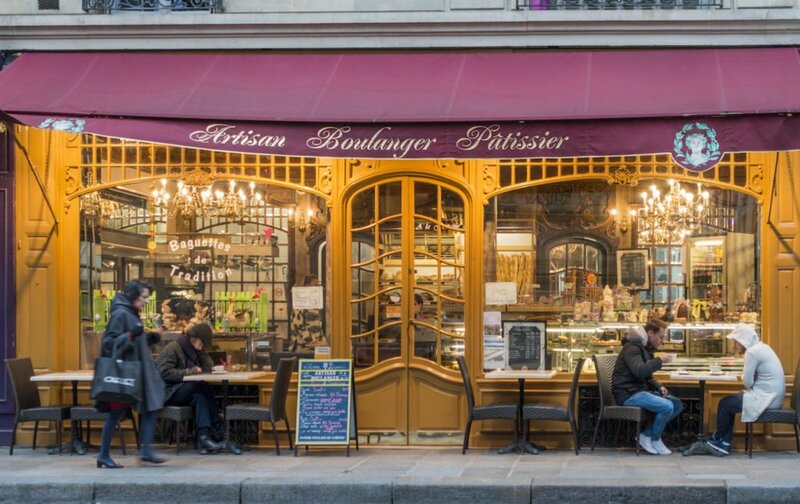 Paris wouldn’t be Paris without its bakeries and pastry shops; they’re a necessity of French life. But knowing how to order at a French bakery can be intimidating. 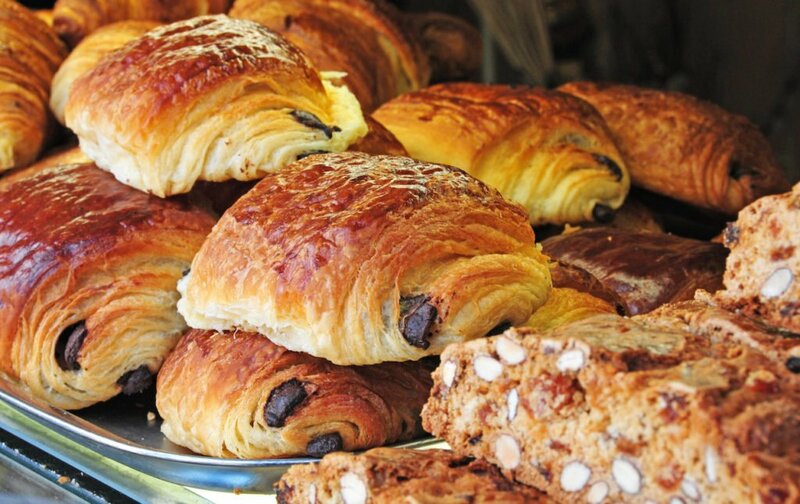 This guide will help you know what to order and how to order in a French bakery. We’ll show you how to build a basic phrase in French, how to pronounce tricky words and tell you all about each item. For example: how to order a well-done baguette vs. a softer one; how to get a loaf of bread sliced; and the difference between a regular and a traditional baguette. There’s lots to learn, so put on your thinking caps, and let’s parle Français! First things first–learn how to say hello at the very least. The rest you can manage through pointing and holding up fingers, and if you’re lucky, the store clerk will understand English. But, just in case you want to try to form a complete sentence, here are the most basic words you’ll need to order in a French bakery. 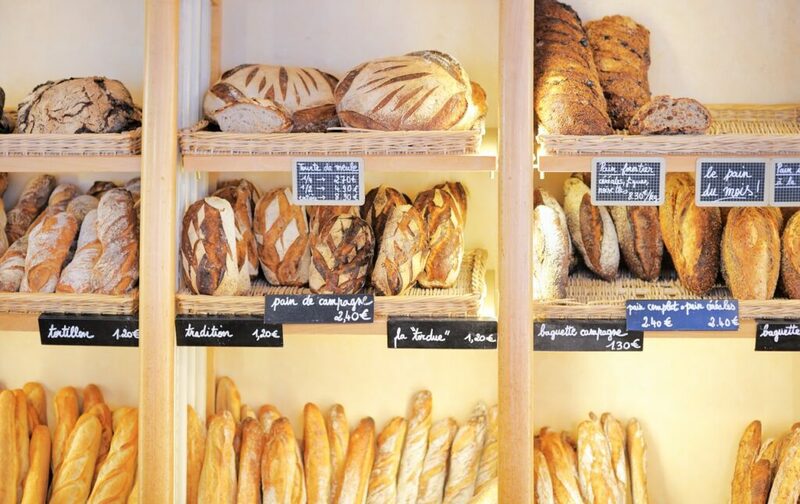 Below is a list of the items you’ll find at every single boulangerie in Paris, and the ones you’re most likely to order at some point. There are pronunciations, sample phrases and when applicable, variations or modifications of the item that you may find useful (such as flavors, sliced, well-done, etc). If you’d like to actually hear what the pronunciations sound like, Google Translate has a wonderful tool. Just select French, copy and paste the phrase you want to hear, then click the little speaker icon in the bottom corner. A lovely robotic computer voice will then pronounce the phrase for you. Sample Phrase: Je prend une baguette, s’il vous plaît. I’ll have a baguette please. Variations: normal or tradition. Bien-cuite or pas trop cuite. The baguette is a staple of French life. They’re long, quite tough on the outside and would make a decent weapon in a pinch. 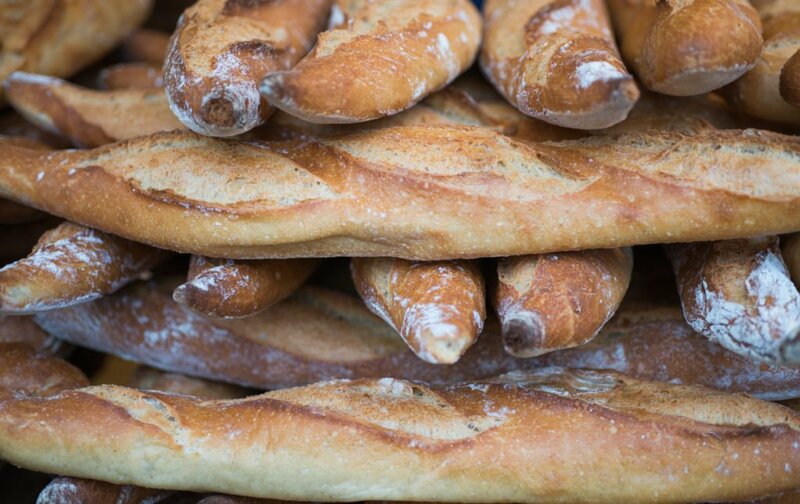 There are a few different things to know about baguettes: 1) always go for the baguette tradition, that is, a baguette that’s been made with minimal ingredients and therefore is more old-fashioned and pure. The other variation, the baguette classique or baguette normal, has some additives, so it may last longer before becoming too hard to eat. Try both if you wish to see what you prefer. Another note on baguettes. If you prefer a well done stick of bread, you’d say “une bagette bien cuite,” (bee-ahn kweet). And if you’d prefer a softer baton of carbs that’s easier on the teeth, ask for “une baguette pas trop cuite,” (pah trow kweet). Sample Phrase: Je prend un pain de campagne tranché, s’il vous plaît. I’ll have a loaf of country bread sliced please. Sample Phrase: Je prend deux croissants, s’il vous plaît. I’ll have two croissants please. 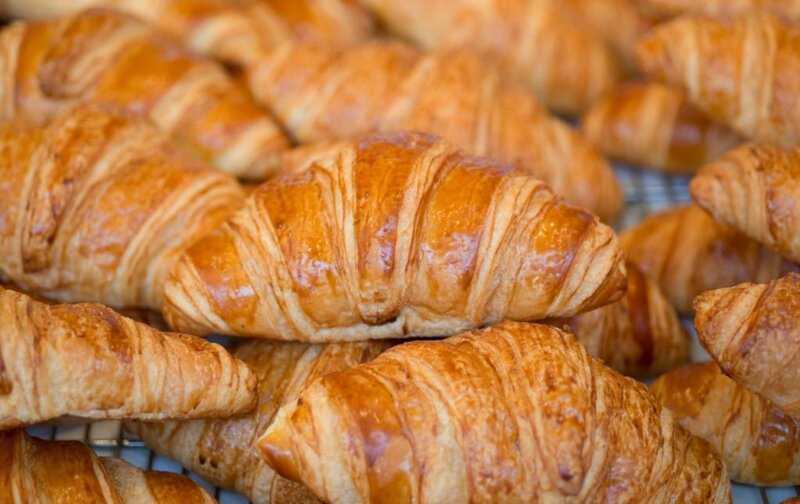 Ahh, the flaky, buttery, layered, crescent-shaped slice of heaven that is a croissant. If the boulangerie you’re in offers two different types of plain croissants, do yourself a favor and go for the one called croissant au beurre. This type is made with even more butter and is therefore all the more delicious. The French are generally purists when it comes to their food and language, so you will hardly ever see a croissant filled with anything, the only exceptions being the pain au chocolat (below) and the croissant aux amandes, the sweet almond croissant, filled with almond cream and encrusted with almond slices and powdered sugar. Think of it as a bear claw but much, much better. Also, croissant sandwiches aren’t popular in France, possibly because the French categorize them more as a sweet pastry, or viennoiserie, than a bread. Sample Phrase: Je prend un pain au chocolat, s’il vous plaît. I’ll have a chocolate croissant please. Variations: Chocolatine, used in some southern regions of France. One particular order at a French bakery can be confusing. Some would argue that a pain au chocolat (literally translated chocolate bread) is the same thing as a chocolate croissant, so why isn’t it called that in French? In fact, in the past, the dough they used to make pain au chocolat was much more bread-like, not as flaky as the modern croissant. You’ll find lots of variation among different bakers in France, some use actual croissant dough (it probably makes the baking process a bit more efficient), while others are more old fashioned and use a denser, less airy dough. Pain au lait (pan oh lay) – fluffy little bread pieces that are usually plain – kids love them with Nutella. Brioche (bree-oh-shh) – fluffy yeast bread sometimes filled with bits of things like chocolate or raisins. Chouquette (shoo-kett) – bite-sized puff pastries topped with large sugar crystals. Sample Phrase: Je prend une quiche lorraine s’il vous plaît. I’ll take a ham and cheese quiche please. A quiche is a savory tart or flan that is typically filled with meat, cheese and/or vegetables. 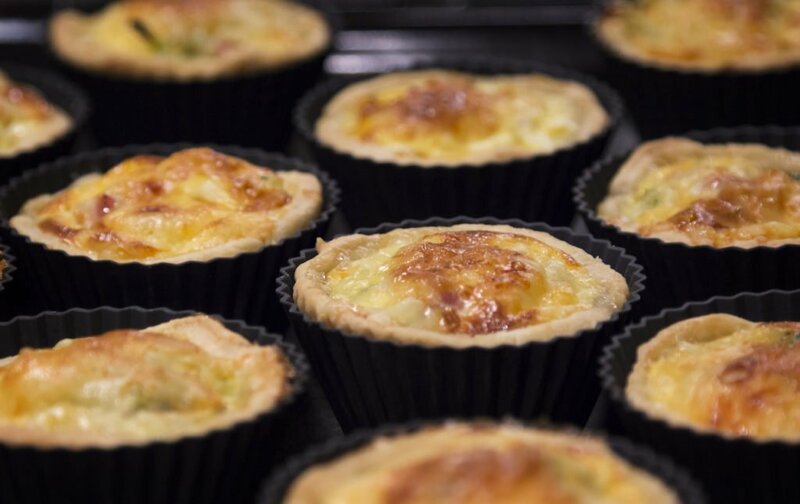 The most common type of quiche in France is the Quiche Lorraine, which is filled with lardons (bits of soft bacon) and gruyère cheese. There are tons of different possibilities, however, like poulet poireaux (chicken and leek), thon, tomate et fromage (tuna, tomato and cheese), saumon fumé (smoked salmon) and the list goes on. We suggest buying a couple different small quiches so you can try out different flavors. Sample Phrase: Je prend une boîte de macarons, s’il vous plaît. 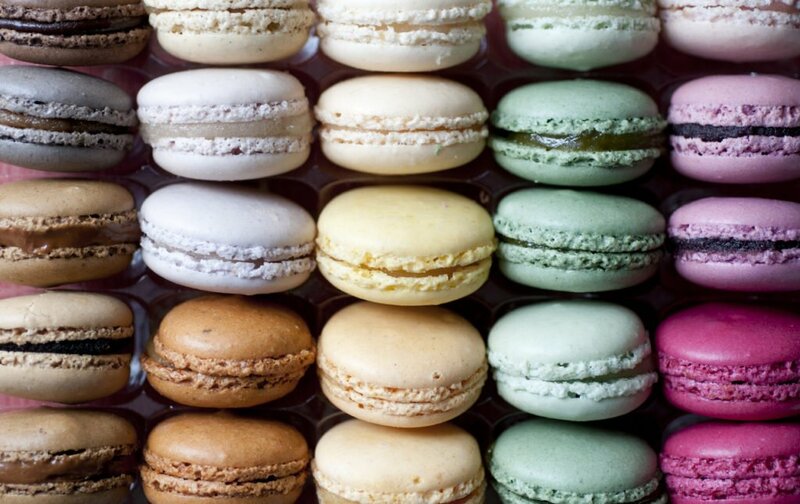 I’ll have a box of macarons please. Don’t make the mistake of referring to macarons as “cookies.” It can be seen as an insult to the French. These come in various flavors and colors, so when you want a lemon macaron, you’d say macaron citron. You always put the flavor after the noun. Most likely you’ll be ordering a box of macarons at Ladurée or Pierre Hermé, and in that case, all the shop workers there speak English, so don’t worry about trying to speak French. Sample Phrase: Je prend un éclair au chocolat, s’il vous plaît. I’ll have a chocolate eclair please. French éclairs are nothing like the gigantic, overstuffed American éclair. Think of them as simply a elongated cream puffs (choux, in French). 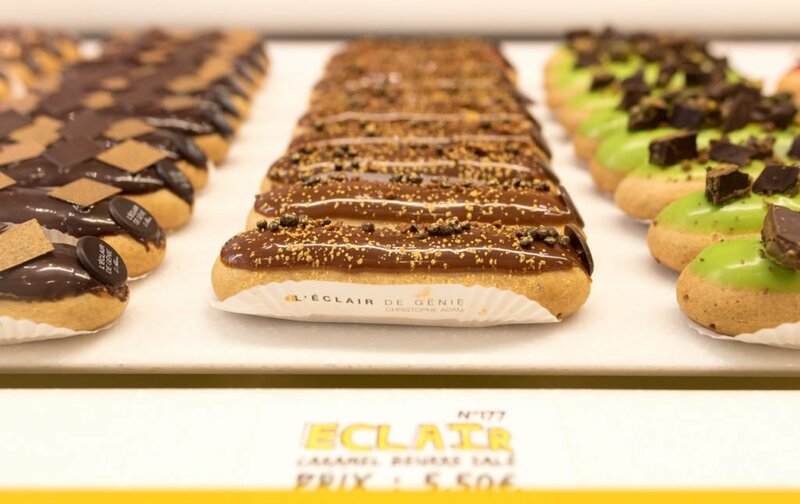 The most common flavors are chocolate, coffee, caramel, vanilla and pistachio, but specialty shops like Éclair de Génie have really elaborate, unusual flavors, so just read the labels or make good use of your pointer finger. Just like with macarons, the flavor always goes after éclair. Sample Phrase: Je prend une tarte au fraises, s’il vous plaît. I’ll have a strawberry tart please. When you combine the talents of French bakers with the perfectly ripe and flavorful fruit of Europe, you get one of these delicious sweet treats. 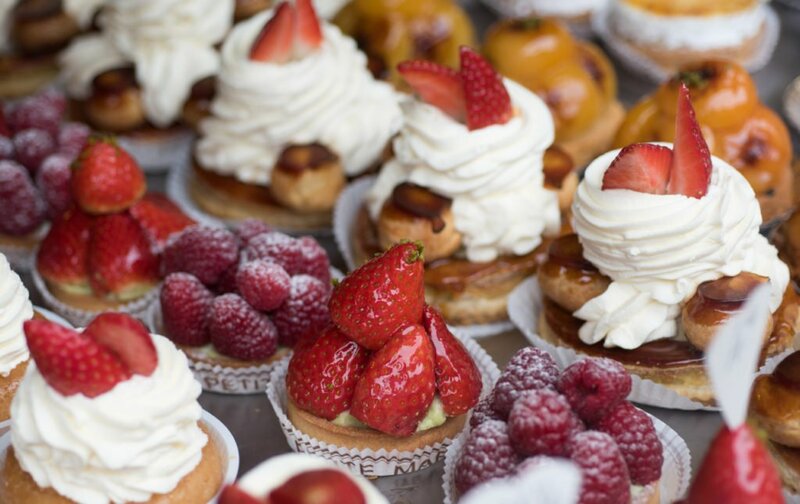 The most common fruit tartes you’ll find in France are strawberry, raspberry and lemon. The fruit quality in France is generally superior to the USA. Their strawberries are out of this world when in season, so expect a lot of real fruit flavor, not just sugar. 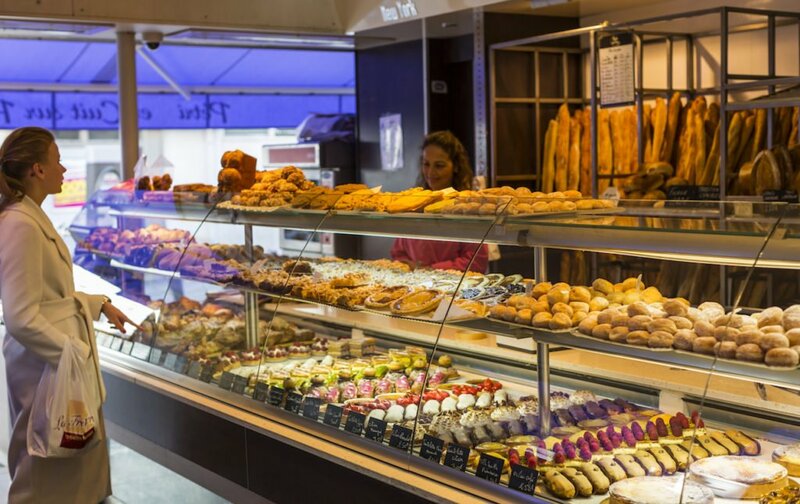 French boulangeries and pâtisseries offer up hundreds of different varieties of goodies, so this list is nowhere near exhaustive. 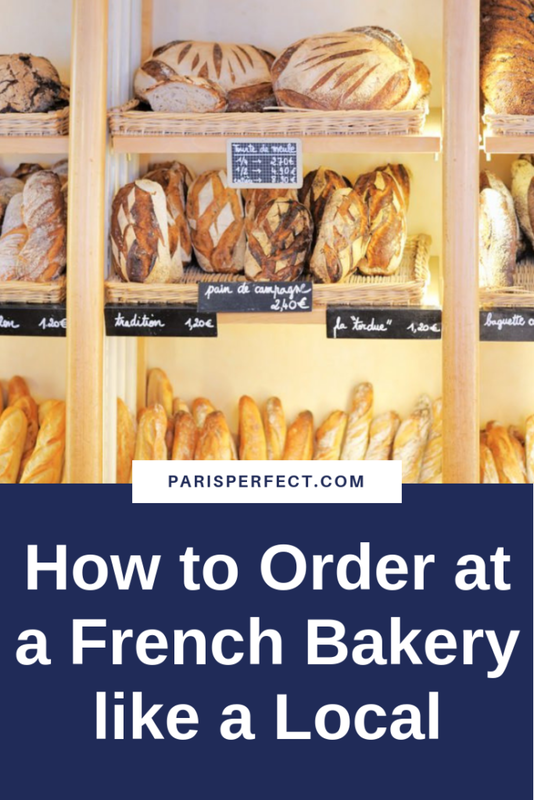 But now you know the basics of how to order at a French bakery. For a list of even more specialty pastries, see this blog post: Pretty Pastries of Paris – the Seven Best Sweets to Sample! Are you ready to live like a local with Paris Perfect? Click here to browse all of the beautiful apartment choices! Call 1-888-520-2087 from the USA or email [email protected] for our apartment reservation team. NEXT: The Perfect Paris Apartment for 8 People! Posted on Friday, April 28th, 2017 at 12:00 pm in Parisian Living. You can follow any responses to this entry through the RSS 2.0 feed. You can leave a response, or trackback from your own site. oh, this is super helpful. I am spending a long weekend in Paris in December (my first time!!) and have been worried about my college French deserting me when I try to order food. Seriously, I’m more worried about that than I am any other travel mishaps. I’m going to make good use of the phrases in this post! That tarte au fraises is about to make me google where i can find it in my neighborhood right now! This is a super guide – photos are perfect and the pronunciation guide very helpful.